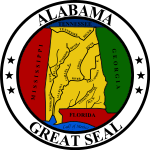 The 1898 Alabama gubernatorial election took place on August 1, 1898, in order to elect the Governor of Alabama. Incumbent Democrat Joseph F. Johnston ran for a second term in office. ^ Alabama. Legislature. Senate (1900). Journal of the Senate of the State of Alabama. ^ "AL Governor 1898". Our Campaigns. Retrieved October 26, 2016. This page was last edited on 21 December 2018, at 19:30 (UTC).